I’m not going to lie, mornings can be a bit rough for me. I’m a night owl by nature, so my mind is often whirring away in the late hours of the evening. Sometimes I can just shut it down and get to bed at a (semi) reasonable hour. Other times though, I just need to roll up my sleeves for a 10:30 pm bake sesh (because obviously that’s the right time for cookies). One thing I’ve learned is that even though I don’t always get to bed on time, there are other ways I can make my mornings a bit less frantic. Things like making sure I have my bag packed the night before, having at least one pair of (kinda) matching socks scoped out, and prepping my lunch and breakfast in advance. The last thing I want to be doing in the morning is fretting about what I’m going to eat. I’d much rather be getting a bit more shut eye, wouldn’t you? Baked egg muffin cups are definitely the lazy gals’ (or guys’) way to a quick, protein-packed breakfast. They’re portable, delicious and can be eaten straight from the fridge. I’m obsessed. I like to make a big batch at the start of the week, then wrap up extras so they’re easy to grab on my way out the door. I couldn’t tell you how many of these I’ve devoured during my drive to work! It’s borderline as embarrassing as when I sing in the car, which is saying a lot. 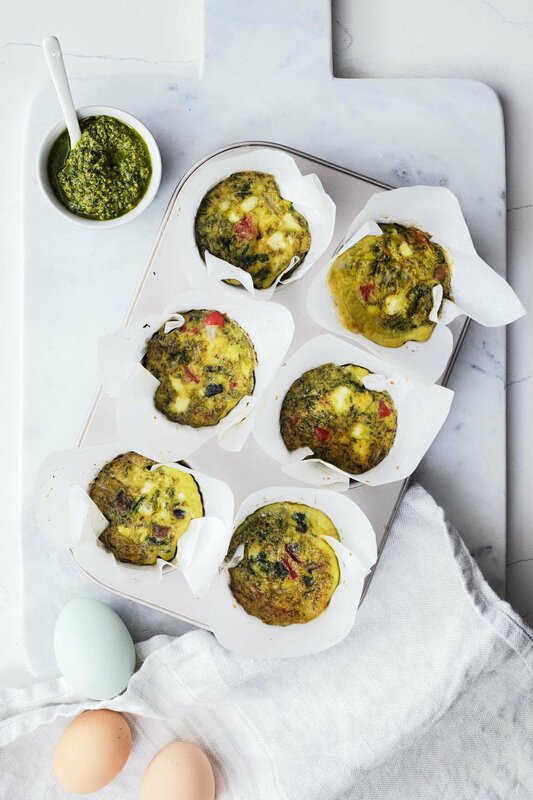 The formula for baked egg cups is pretty simple: veggie filling + eggs, poured into muffin tins. You can feel free to go crazy with your own combination of extras, but let me tell you about my personal favorite. It features onion, mushrooms, red peppers and spinach. In fact, it’s likely you already have a lot of these ingredients already sitting in your fridge! The pesto might seem like the odd man out here, but trust me on this one - it’s an easy way to really bump up the flavor. And it pairs with the crumbled feta like magic. So good! You can bake these egg muffins in regular tins or even silicone muffin trays if you have them (I don’t). If using standard metal muffin tins, be sure to either grease them or line them so the eggs will pop out easily. It also makes cleaning SO much easier. We’ve actually run out of muffin liners at home, so instead I used small squares of parchment paper. The egg muffins take around 20 minutes to bake. They should be golden brown around the edges and slightly puffed up in the center. If you end using muffin liners or parchment paper, be sure to remove the wrappers after the eggs have cooled. It will help release any moisture built up in the baking process. Muffins are good stored in the fridge (covered) for about one week. Preheat oven to 350°F. Set aside 12 muffin tins (either lined or lightly greased). Chop onions, mushrooms, red pepper and spinach. Melt butter in a frying pan over medium high heat. Once hot, add onion and cook for 2-3 minutes until translucent. Add mushrooms and red pepper. Cook, stirring regularly, for 5 minutes or until softened. Add spinach and stir until the spinach has softened (1 minute). Remove from heat. In a large bowl, whisk together eggs, milk, pesto, salt and pepper. Stir in crumbled feta. Evenly distribute the cooked vegetables into the 12 muffin tins. Pour the egg mixture on top to fill up each cup. Bake for ~20 minutes until the eggs are set in the center. Let cool in the tin. Remove once cool and refrigerate extras in the fridge. *Regular milk or regular, unsweetened nut milk. If using liners (e.g. muffin liners or parchment paper), it’s best to remove them after the eggs are baked. Store eggs directly on a plate or in a sealed container.